Here they are in all of their glory! - Dad likes to "play" outside, and finds that his hands get too cold with plain gloves on, but he can't feel to do anything with mittens on. 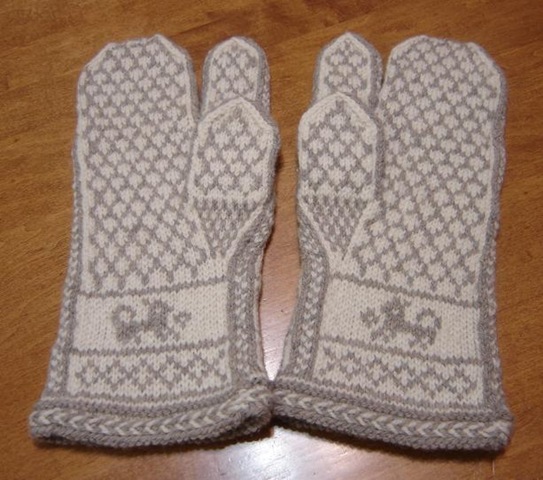 These "trigger" mittens, or "picking" mittens as we used to call them when I was a kid (seriously, in our house - nose / toilet humour always found a healthy place) give the right balance of warmth and practicality. 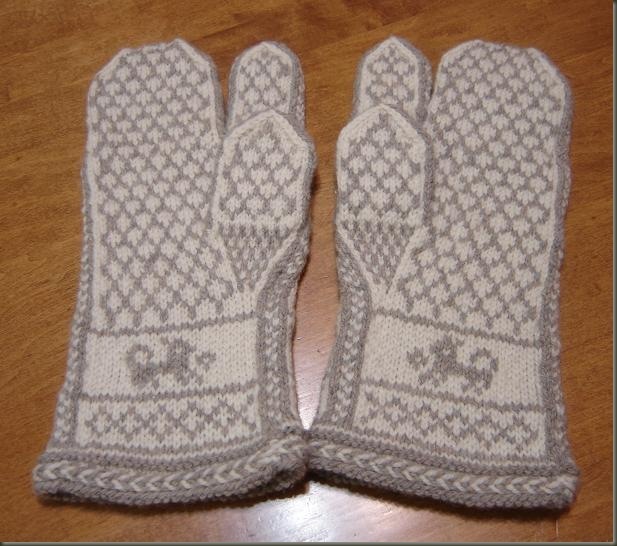 Plus - they are basically two layers of 100% wool... the knit layer and the woven floats on the inside. Doubly wooly warm. - My dad has been a sport fisherman for as long as I can remember. I showed him some mitts with moose, and birds and other creatures on them, and of course he asked if there could be fish instead. I didn't have much luck finding a rainbow or a speckled trout pattern, but this little fishie turned out ok I think. The palm side of the mitts features a common traditional all over pattern, which conveniently enough looks a bit like fish scales. - My parents also have 2 small Dogs - Molly and Sophie - so I included a small mutt on each of the wrists. 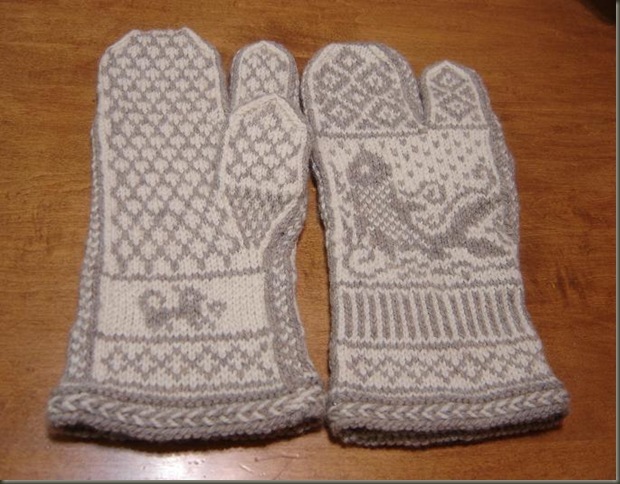 - As for the rest of the mittens, I kind of made things up as I went. I chose some basic geometric patterns, and decided the cuff needed a latvian braid for good measure. 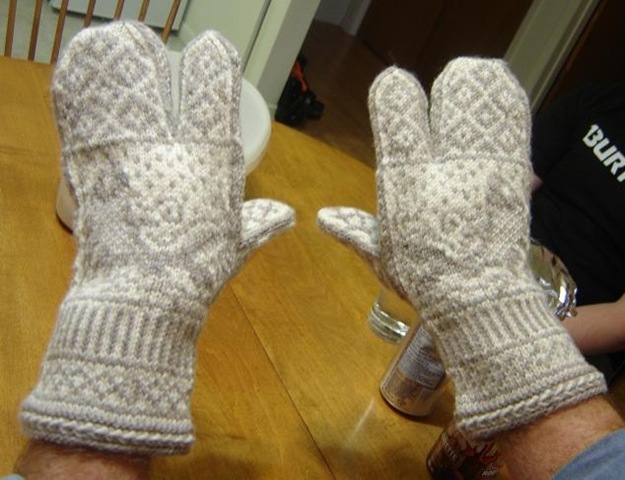 I took measurements of Dad's hands and just knit until the mittens felt right. 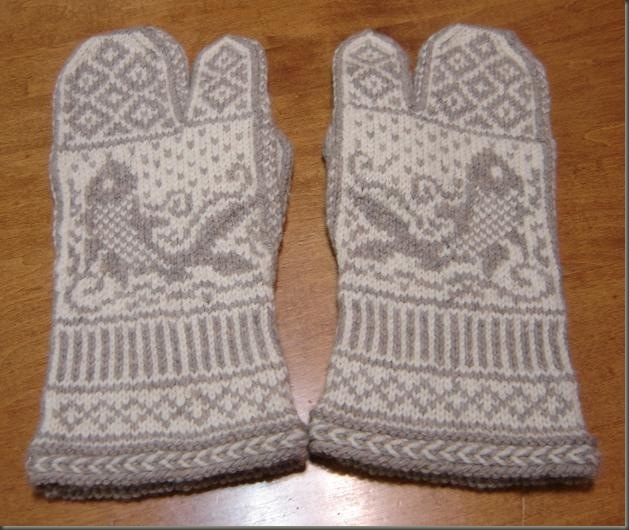 Dad likes his mittens to come up nice and high on the wrist... to avoid drafty sleeves. 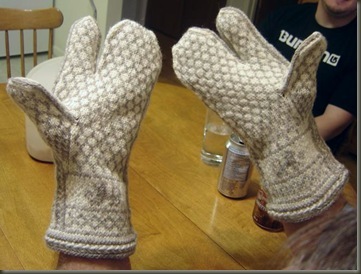 And here they are on the hands they were made for... Thanks for letting me take your picture Dad! I hope he gets lots of use out of them... Mom says he has them in the car to wear out-and-about for now, but I hope he really puts them to the test. That's how I know he really likes something... he will wear them completely out! Strawberry Thrum Mittens...mittens, mitts, thrum, how to make thrum mittens, making thrum mittens, merino, wool, pattern, how t...Custom Mittens - Made to Order!mittens made to order, homemade, custom designs, reasonable prices, just for you,Magic Mirror MittensFancy Cable mittens in 100% Baby Alpaca soft and smooshiness! Great-looking mittens. I love all the special details. What a great gift for your Dad.